So yesterday I started diving into a 300 count (or more) box that came from Pat at Hot Corner Cards. Let's get back to displaying the goodies within by seeing how Pat helped fill my binder of bunting cards. About 40 or so of the cards in the box had players positioned to have, or be prepared, to drop down a bunt. As this binder has grown, it's interesting who they (the card companies) select to be enshrined forever on a card squared to the pitcher. Some are obvious. One would expect that if a pitcher is on the card, at the plate, he's probably not swinging away unless the sacks are empty. Three things on these cards: a) these guys REALLY need to work on their bunting. You will never deaden the ball with your hands that close together. b) You don't want to move the bat towards the pitch, unless you are trying to pop up the ball. And c) Sorry Nick - find your own copies of these pitcher at the plate on COMC. 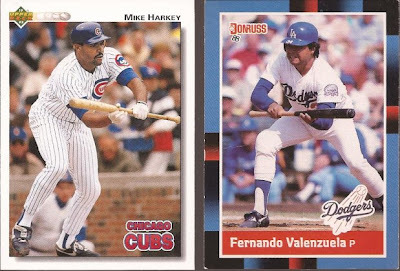 BTW - combined career batting average between these two - .197 with 10 homers (all by Fernando). 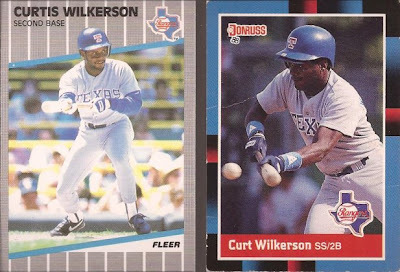 Now, let's go to the other end of the spectrum to players you would NEVER expect to bunt. Combined lifetime home runs of these 3 is 1248. Granted, about 30% or so are aided with steroids. I'm not looking at you, Kirk or Harold. See, though, how they all hold the bat - hand at the bottom with the other half way up. Kirk it going to drag, but he is not about to swat at the ball. Baines is waiting for the pitch to come to him. And Sammy.....is contemplating if he has enough HGH to make it through September. But I digress. 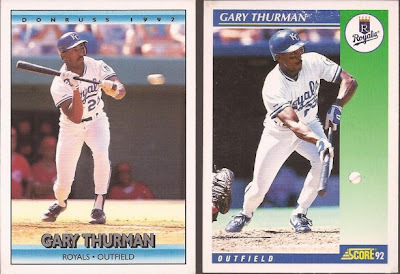 Gary Thurman. Different games, btw. You can tell by his stirrups. Doug Dascenzo, from both sides of the plate. 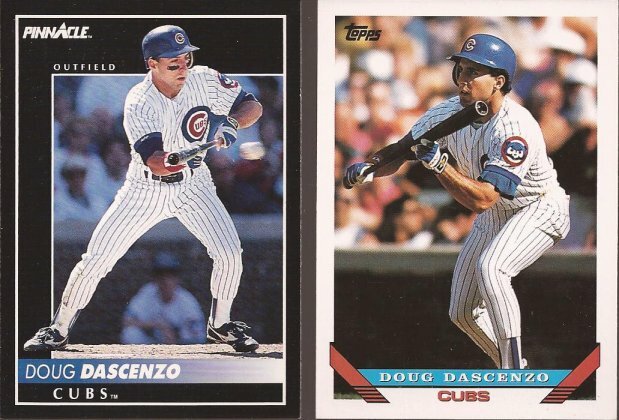 The card on the right is perfect positioning to bunt. And Lou Whitaker. Remember this name - we will visit Lou a LOT in part three of the box. 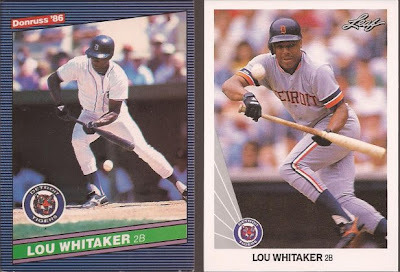 So who takes the prize as the best bunt card in the box? Giving the win to Andy Sheets. 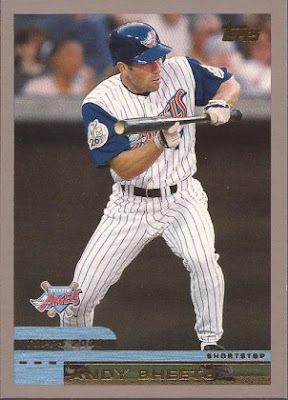 Sure, it's a nice card, and Andy is squared up well. And yes, those Angel uniforms are horrible, but check out the killer view of the memorial patch for Gene Autry. One of the better honors shown to a former owner. Ok - tomorrow: double plays. 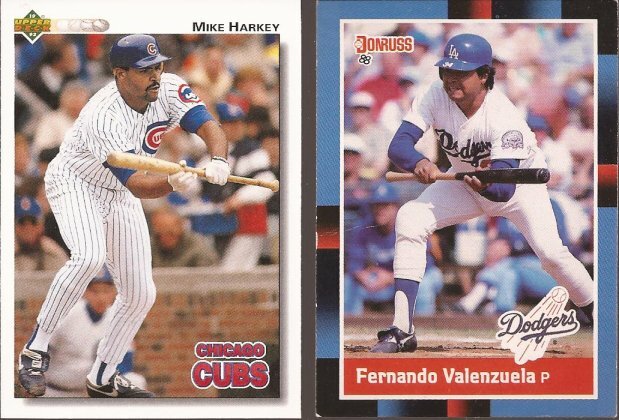 I can't believe I don't have a copy of that '88 Donruss Valenzuela in my collection already. Love MWC! Man, haven't watched an episode in years. Hope it streams on Netflix one of these days.